What Type of Stethoscope Does a Nurse Need? Stethoscopes are used to monitor and assess the health status of your patients. But there is more to picking the best stethoscopes for nurses than just coordinating the tubing with your scrub’s color. You must assess acoustic sensitivity, chest piece suitability, the diaphragms, as well as its noise cancellation capability. If you find it daunting to weigh in all these features, check out the following selection of the top stethoscopes for nurses. 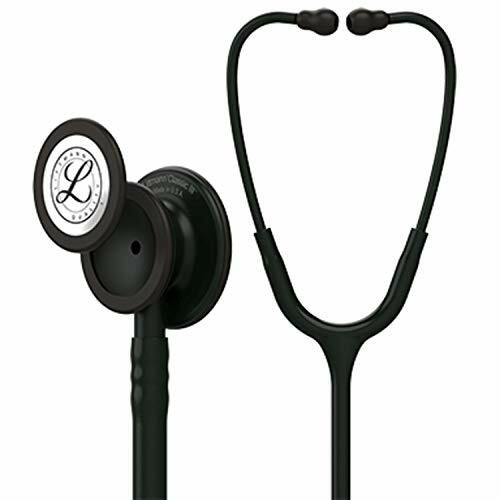 The 3M Littmann Classic III is the golden-standard of the best stethoscopes for nurses. It is a monitoring stethoscope designed for healthcare professionals in non-emergency environments and is characterized by unrivaled acoustic sensitivity. You can use it for either physical assessment, diagnosis, or patient monitoring on kids and adults alike, thanks to its versatile, tunable diaphragms. We also liked that the pediatric chest piece side converts to a traditional open bell by replacing the diaphragm with a non-chill rim. It also produces crystal-clear sound for heart, lung, and bowel diagnosis. Its next-generation tubing comes with improved resistance to skin oils and alcohol, and it’s really easy to clean. It’s even available in 18 stunning colors, so you can easily add a personal touch to your scrub. Although a bit on the more expensive side, it also comes with a 5-year warranty. If you’re still a student or just began your career, the Omron Sprague Rappaport Stethoscope could be a great pick. It’s cheap but comes with great acoustic sensitivity and two ear tips that provide decent noise cancellation in most environments. A bit heavier than a last-generation stethoscope, the Omron Sprague is still quite comfy to wear for extended periods of time. Three open bells and two sizes of diaphragms also make it ideal for diagnosis on kids and adults alike. The chrome-plated chest piece and latex-free tubing trigger no allergic reactions in sensitive people, and you may also like the dual-tube setup that provides crisper sounds as long as the tubes don’t touch each other. All in all, this is an excellent stethoscope considering its price, and it’s an excellent pick for any nurse shopping on a budget. A higher-end stethoscope for freshly graduated nurses, the 3M Littmann Lightweight II S.E. is ideal for monitoring blood pressure and general diagnosis in a non-emergency ward. It has reliable acoustic performance and a tear-drop shaped chest piece that fits beautifully under the blood pressure cuff. The anatomically designed headset and nice heft of only 118 grams make it a nice treat for nurses and caregivers who have to wear it all day long. Moreover, the non-chill rim and tunable diaphragm make this entry-level piece quite versatile. 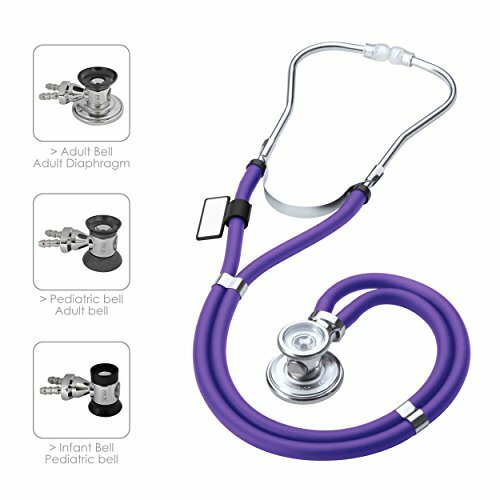 The stethoscope comes in 7 colors and stainless steel finish and is backed by a 2-year manufacturer’s warranty. 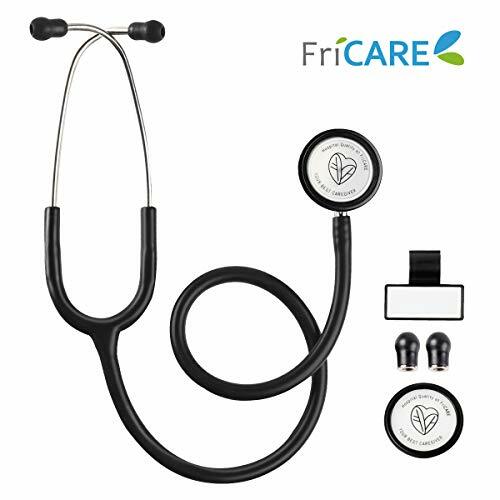 The FriCARE Dual Head Stethoscope can meet most needs of nurses starting their career in non-emergency wards. It is ideal for diagnosis and blood pressure readings even if it doesn’t provide excellent acoustic performance. Nevertheless, its versatile design with dual-sided chest piece and thick tubing increase this unit’s versatility. The stethoscope is great to use on all patients and comes with latex-free, matte finish tubing that’s very easy to keep clean. Another nice feature is the detachable ear tips that are easy to disinfect or that can be changed if the stethoscope is used by two or more people. The scope comes with a valuable kit that comprises ear tip replacements, an extra diaphragm, as well as a detailed user manual and even a nametag if you want to make it easily recognizable. Backed by a 2-year basic service guarantee, this could be a great starter piece if you don’t want to break the bank. 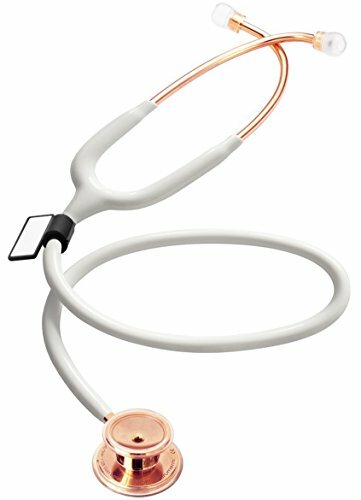 If you’re looking for a reliable stethoscope able to combine function with style, the MDF Rose Gold Dual Head Stethoscope could be the right one for you. This piece incorporates all specs you could expect from quality equipment. High-performance is ensured by the ultra-sensitive diaphragm and dual chest piece that makes it ideal for accurate diagnosis. It provides clear acoustics for heart, lung, and bowel, but you can also use it for blood pressure readings. The anatomically-angled headset and extra-thick latex-free tubing make it a pleasure to use. At the same time, the super-soft silicone ear tips provide reliable noise cancellation in most environments. Performance aside, this stethoscope also looks amazing; it has a rose-gold finish that make it elegant. Backed by a lifetime supply of replacement parts and stylish, this is a great choice for all nurses who want to spice up their scrubs. 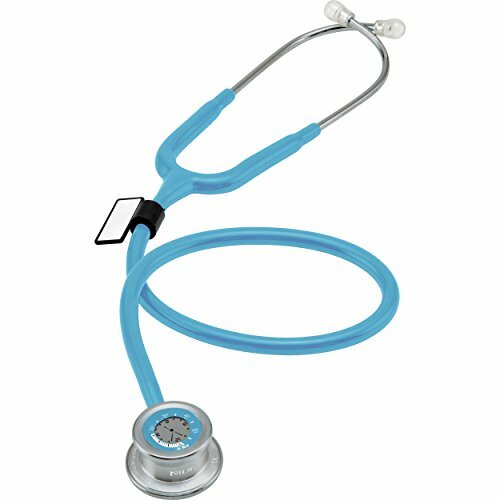 The ADC Adscope 603 Clinician Stethoscope by American Diagnostic is a mid-range instrument ideal for most nurses. It’s engineered in stainless steel and comes with a combination chest piece that catches all sounds accurately. Perhaps the best feature is the adjustable frequency design that enhances acoustic performance. Furthermore, the ultra-sensitive non-chill diaphragm produces even greater amplification and crisper high-frequency transmission. The non-chill bell also provides an exceptional low-frequency response; undoubtedly, this stethoscope is up to anything, whether it’s heart, lung, or bowel diagnosis. A lifetime warranty and an endless supply of free consumables, including diaphragms and ear tips, boost its value for money; and you’ll also find it easy to pair it with your scrub thanks to the generous color choices offered by the brand. 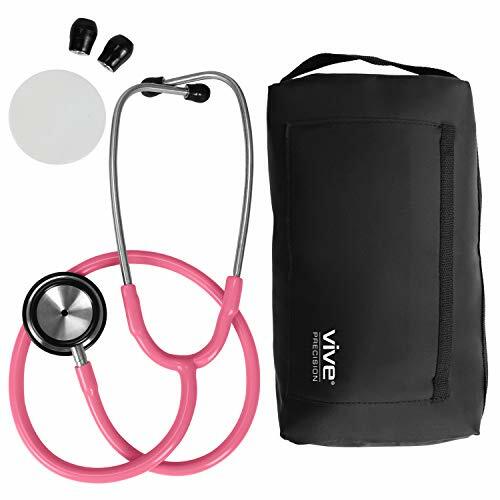 The Vive Precision Stethoscope might not be the most performing out there, but it’s undoubtedly a great choice if you’re looking for an affordable unit. It comes with a dual-sided chest piece and produces crisp and clear sounds. Its stainless steel diaphragm, alongside the small bell, will help you detect both high and low-frequency sounds. It’s also capable of providing superior noise cancellation thanks to the soft silicone ear tips. Designed with patient comfort in mind, this scope also comes with dual non-chill rings that reduce the feel of cold metal on bare skin. As for your comfort, this scope has a lightweight and durable construction. It comes stylishly packed in a convenient pouch and boasts two colors you can match with your personality or the color of your scrub. If you’re mainly monitoring vital signs in either an emergency or non-emergency ward, the MDF Pulse stethoscope could be a nice addition to your nursing arsenal. As its name suggests, this is a two-in-one scope that combines the benefits of a quality single-head stethoscope with those of a digital nursing watch. The advanced chest piece is ideal for monitoring the pulse, heart rate, and blood pressure; the ultra-thin fiber diaphragm also provides excellent amplification and transmission of heart and lung sounds. A patented pyramid chamber and latex-free PVC tube also contribute to sealing out the exterior noises, improving acoustic accuracy. Another nice feature is the ErgonoMax headset which ensures durability and comfortable fit. The scope comes with soft silicone ear tips available in small and standard sizes, a spare ultrasensitive diaphragm, and an ID tag for stylish stethoscope identification. 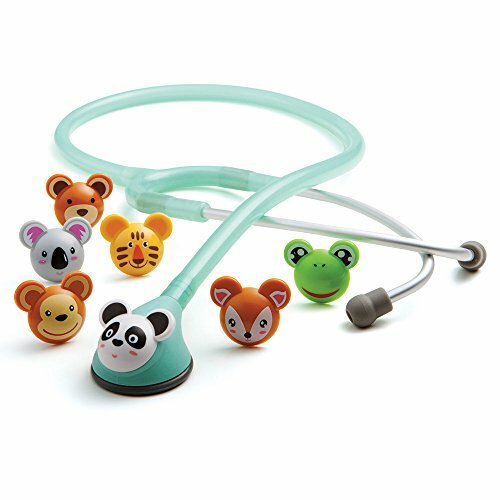 This stethoscope from ADC is designed for pediatric nurses, and it will surely brighten up your little patients’ day with its fun, kid-friendly design. It comes with multiple snap-on animal faces and three fun tubing colors designed specifically for pediatric wards. The composite chest piece combines the acoustic response of a traditional dual-side stethoscope into a one-sided piece that delivers excellent acoustic quality for all vital sounds. You can switch from low to high frequencies by simply alternating pressure and tuning the sensitive diaphragm. As you can expect, the scope is also built with your comfort in mind. It comes with an ergonomic headset and silicone ear tips, which provide both comfort and acoustic seal. As for your patients, the non-chill diaphragm won’t feel too cold on the bare skin. Regardless of your specialty or ward, the MDF Sprague Rappaport Stethoscope is an all-around nursing gear to have in your arsenal. It combines the qualities of five stethoscopes in one and addresses a wide range of diagnostic applications. This versatile scope boasts a classic design but comes with three different chest pieces for kids, adults, and infants. These interchangeable pieces are made from zinc-alloy and are precisely machined for a high acoustic performance. The tubing is also designed for superior sound transmission and sealing of ambient noises. We also liked the headset, constructed from chrome-plated brass and designed for individual custom-fit. Soft silicone ear tips available in small and standard sizes, as well as patented SafetyLock ear tip adaptors, enhance user comfort and safety. Backed by a lifetime warranty and coming with a bountiful supply of accessories, this is another stethoscope that can satisfy most nurses. The first thing you should consider when picking the best stethoscopes for nurses is the application. There are various types of stethoscopes a nurse might need, but it all reduces to your specialty or ward. You can choose from the following essential types. Sprague Rappaport stethoscope: Is a classic type defined by two separate tubes for each ear and a double-barrel chest piece. These scopes produce a great sound quality and are ideal for general purposes, such as diagnosis auscultations and monitoring of vital signs. Single-lumen stethoscope: Also designed for general purposes, these scopes come with a single tube and can have either a single-head or double-head chest piece. They are often preferred to the Sprague Rappaport type because their design eliminates the noise created by two tubes rubbing together. Cardiology stethoscope: As its self-explanatory name suggests, this type is designed for cardiac assessments. These stethoscopes are the most expensive but impress with superb sound quality. They can have either single or double-head chest pieces and serve much more than heart auscultations. The difference between these scopes and the other two above is the bi-lumen design made into a single tube. Pediatric stethoscope: Is similar to the classic but has a smaller chest piece and a diaphragm specially contoured for pediatric patients. A variety of this type of stethoscope is the infant stethoscope, which has an even smaller chest piece. One of the main things you’ll have to decide when buying a stethoscope is whether you need a single or dual-head type. Single head stethoscopes: Provide a wide frequency sound output for both high and low-frequency sounds. 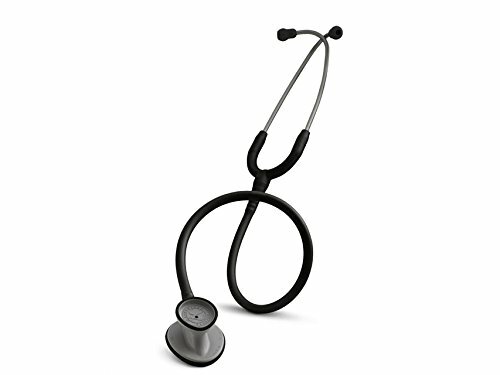 You’ll be able to change the sound range by simply applying pressure on the diaphragm; these stethoscopes are ideal for general use including taking vital signs, reading blood pressure, and lung auscultation. They can also perform well for basic heart assessments. Dual-head stethoscopes: Consist of a diaphragm and a bell. The former is used for high-frequency auscultations while the latter for low-frequency ones, and will provide more accurate assessments for a specific diagnosis. Most nurses prefer this type. Another variety which is very expensive and usually used only by cardiologists is the three-head stethoscope which is used for critical cardiac assessments. Besides the type of stethoscope, you must also weigh in a few features that will ultimately determine the quality of your equipment. Chest piece: Is responsible for capturing sounds and should be made from stainless steel, a material renowned for its sound-conducting properties. This material is also durable and prevents air leaking. Entry-level stethoscopes may also come with aluminum or zinc alloy chest pieces, which are great for monitoring the vital signs, but if you’re aiming for the best quality, stainless steel is the way to go. Diaphragm: Together with the headpiece, it also captures sounds. You can use it to switch from low to high-frequency sounds by applying lower or higher pressure. It should ideally be made from either resin or PE compound and must be air-sealed so that it can produce higher amplification of the sounds. Non-chill rim diaphragms also reduce the unpleasant feel of cold metal on bare skin. Tube: Is the part of the scope that transmits sound from chest piece to your ears. The quality of this component determines how well the scope can reduce external noises so that you can focus on body sounds only. PVC tubes are the most common, as the material is crack resistant and it can be folded without worries. Ear tips: Should be made from soft silicone. It is essential to fit perfectly in the ear canal to reduce ambient noises, and they must also be properly angled, to ensure crisper sound quality. Ergonomics: Regardless of the type of stethoscope you decide to buy, make sure it’s easy to use and comfortable to carry. Check the length of the tube as well as the overall weight of the unit, and make sure it fits you perfectly. Remember you’ll have to carry it around your neck for the entire day, so these details are essential. 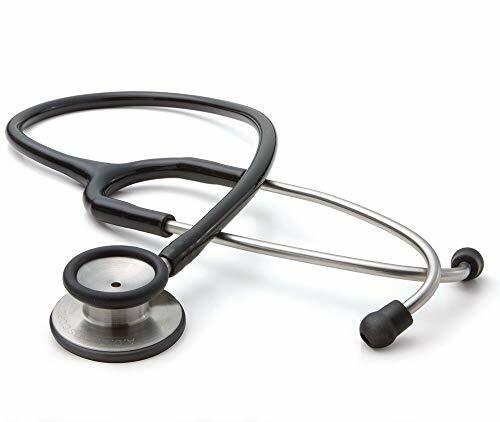 While considering the best stethoscope in the medical profession for nurses, identifying your area of expertise, whether in pediatrics, cardiology, or the OR for example, will help you in choosing the most suitable stethoscope. If you’re working in pediatrics, it’s ideal to have a stethoscope that caters to children or one that lets you adjust between different sound frequencies. Pediatric stethoscopes differ from cardiology stethoscopes or standard adult stethoscopes and thus understanding this distinction is an important factor. In most cases the best stethoscope will be comfortable for you and your patient, have reliable high definition acoustics and have an adjustable diaphragm to let you adjust between low and high frequencies. What makes the best stethoscope for a nursing student? 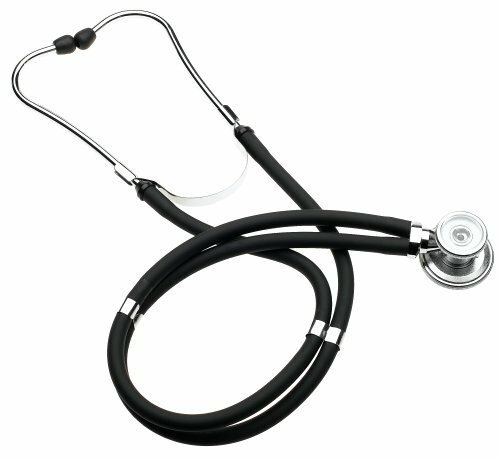 If you are a medical student and somewhat uncertain of the exact area you are going to pursue, it’s best to pick up a standard issue stethoscope. I believe it’s important to have a high-end stethoscope when training to be a nurse, as they are more accurate in depicting vital sounds, which could otherwise be missed with a low-end stethoscope. In considering the high quality stethoscopes, one thing to keep in mind is that they are not always the most expensive. A top-notch stethoscope can be found in leading companies at affordable rates. Again, it's jsimply a matter of finding one which will suit your area of expertise. Under all circumstances, you want to ensure that the stethoscope you do end up purchasing is functional for a variety of situations. No matter how specialized you may be, it's extremely likely that you will need a stethoscope suitable for a wide range of patients and applications. In all of our reviews, we took functionality and versatility as the most important factors, which is why the following three stethoscopes made our list for best stethoscopes for nurses and nursing students. 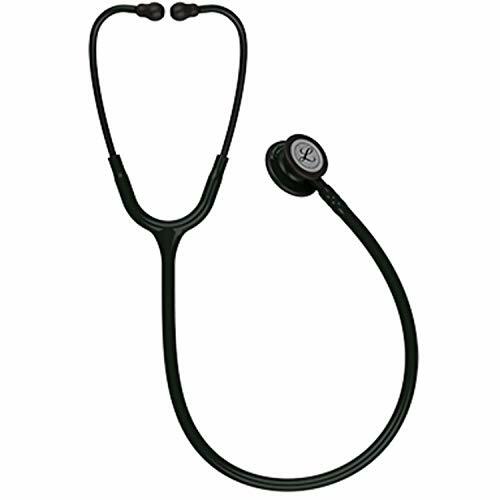 The Littmann Stethoscopes have been around since the late 1960’s and have been offering high quality acoustics ever since inception. Whether you are a doctor or medical student, Littmann as well as Adscope stethoscopes are superior products that won’t disappoint.